The clue is in the name really. Newcastle upon Tyne. You’d think the sea wouldn’t be far away from a city on the Tyne, especially if you know the river Tyne, but it was far enough and I never learnt to sail on the river or the sea. The weather can be bad up there, even in midsummer, but that wasn’t the reason. I just didn’t come from a sailing family. I had the amazing luck to find myself employed on a 150foot schooner at the age of 21, taking American holidaymakers on two week jaunts out of Antigua in the Caribbean. The job lasted three months – the three months between getting the job and getting sacked from the job. Don’t think badly of me. Think badly of the owner. He would have sacked me after two months if he thought he could ship me off somewhere cheaper than the fare to far away Britain. Working on a schooner in the Caribbean can give you the wrong idea about sailing. It did me. I loved it. Essex was harder. I was living in south east London and had a neighbour who kept a 24 footer on the Crouch. 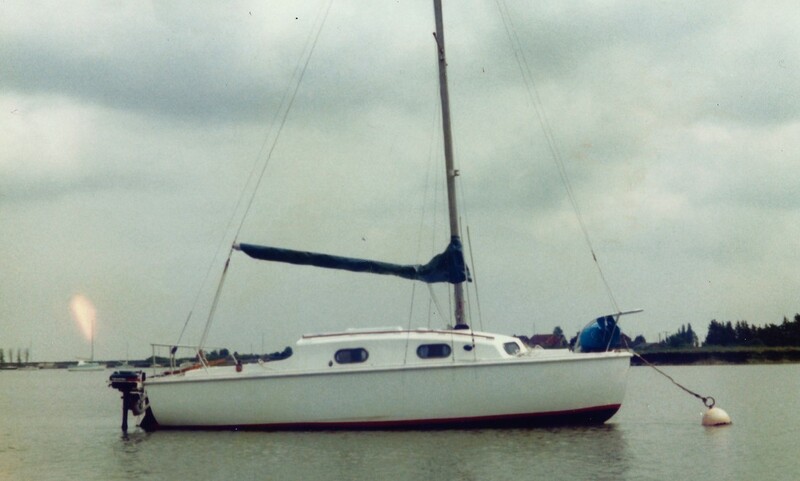 At the end of the season he needed to bring the boat back from the Pyefleet, near Wivenhoe on the river Colne, across the Blackwater estuary to Burnham on Crouch, and wanted either crew or company so he asked me. Not knowing what was meant by “late season sailing” nor the difference between the Crouch and the Colne, I went along. We survived the weekend – and I don’t mean that lightly in the sense that it was cold and rainy and we ran aground several times (each time deliberately) and didn’t get back to the Crouch till 3am. All that was true but so was the bit in the middle where we went for a walk on Foulness sands to wait for the tide to finish ebbing and start to rise again. We were ten miles offshore and ended up running through increasingly liquid sand to beat the rising tide that would have covered Foulness and had already floated our dinghy before we found it in the dark. The lesson I learnt was an oddly positive one: yes, I could live in London and have a little yacht. The next spring, when I bumped into a colleague in his reefer jacket with brass buttons and asked why he was wearing such an odidity he said he was off to the London Boatshow because he was keen to buy a boat. Within a few weeks searching Exchange and Mart he and I had bought our first boat – first boat each and first boat jointly. Shortly after our partnership started it ended but he was available to crew for me on what was now my very own boat. If you buy cheaply enough that can happen. Cheap enough to walk away from if the crunch came. I only knew about the East Coast and I liked it. Rb was at heart a Solent man. Many boats on the market that winter’s end fitted this bill, so I opted for the cheapest. Our partnership fell apart quickly but that didn’t put him off coming sailing to help me learn nor me asking him. We have crewed on each other’s boats ever since. The boat was a Kingfisher 20, one of the early GRP designs. Shallow drafted and bilged keeled appropriately for the east coast rivers. Even so, she couldn’t get to or from her Maylandsea creek mooring to the Blackwater river at half tide, and consequently I soon learned a lot about tides. She was well passed her first flush and consequently I learnt a lot about boat maintenance too. And in between I learnt about sailing. I renewed the rigging by making new wires myself. I learnt to cut and drill, file and bend one inch by an eighth inch stainless steel chain plates. I learnt to swap a rusted galvanised pulpit for a shiney one in stainless. I learnt to sand out the terrible brush marks on the topside left by the previous owner and how difficult it was to repaint the topsides without runs and holidays and equally obvious brush marks of my own. I took apart an outboard engine and put it together without having any parts left over. I learnt to buy, sell and row dinghies as well as push them through the mud of a drying creek. I didn’t have many instruments to worry about although I had to repair the few antiques I had. I didn't just learn about tidal flows and tidal height; I learnt about the real-life consequences of getting a calculation wrong. I learnt to be adventurous. The previous owner lectured me about the dangers of ever leaving the Blackwater river, since he never had in the five years he had owned this boat. I believed him for the first season, and then intrepidly took the tides up to Harwich and back. After that I was ready to bump the bottom from the Crouch and Havingore to Ipswich and Manningtree and that bloody invisible Pye End Buoy on the way into the Walton Backwaters. This little boat made me adventurous because she could be pushed off in most close-quarter accidents and pushed off the bottom in most unexpected groundings. After a while though I felt I needed a boat to take me further afield. I moved from a 20footer to a 24footer and sailed from Wales to Essex just to bring her home. After cruising most of the east and half the south coast of Britain I tried my hand at crossing the North Sea to Belgium and The Netherlands. Looking at the list of things this first boat of mine, this Kingfisher 20, had to deliver for me I have only just now realised that all my subsequent boats had to satisfy a very similar list. As a last resort, I must be able to single hand any boat of mine back to wherever home was. The boat needed the robust simplicity and seaworthiness that follows from that. At the very outset of my buying priorities, it must be cheap, or as we say “a lot of boat for the money.” This of necessity meant my boats would always be old and in need of constant maintenance. But I didn’t mind that: first, it’s all I’m used to; second, I’m a fearful sailor and gain reassurance from knowing by dint of hard work how every bit of the boat goes together. Of course my knowledge of specialisms like electronics and diesel engines lets me down badly, but I’m astonished at how much of a diesel engine I have dismantled in a seaway when there was no alternative, and even more astonished that I have put it back together afterwards. Not everyone, possibly hardly anyone, buys an old boat and pushes off to learn to sail. The RYA wouldn’t like it. There is a whole Health and Safety industry built on the opposite. But you don’t have to go far on your own to learn a lot and I’ve never had to trouble the Lifeboat Services. Many landlubbers get the wrong impression of how affluent sailors must be. My first boat was cheaper to buy and run than the second-hand car that took me too and from its mooring.